Showing results for tags 'Studded'. Here's my Peterbilt MOC with a Formula 1. 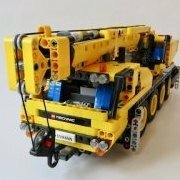 There's about 800 parts in the truck, lenght 0,5m, weight 1kg. No steering hence I had no part for that, however it is easy to modify when I get some more parts. The engine is CAT Turbo Diesel. I took some ideas from set 5580 but other than that it's all my own desing. The Formula has steering and a pull back motor. It's a big rig! Thanks for watching.